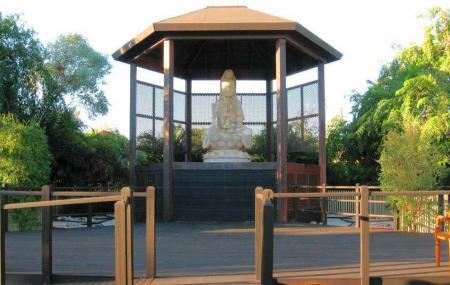 The Buddha Sanctuary is a peaceful heaven located away from the hustle-bustle of the city. Take a step closer to unveil the power of meditation in the midst of a cyclonic travel experience while you take in the surrounding fresh air and appreciate the beautiful greens around you! The place is popular for its ‘Wishing Wall’ a place where you can tie your wish to be fulfilled cosmically or just by the next visitor! A must if you find solace in silence, the sanctuary is sure to ease those stressed nerves you have been ignoring for long. Do write a wish on the wishing wall! Sometimes all you need to do is express what you deeply wish for. Try to attend a meditation session here- a true soul cleansing experience to keep you going. The sanctuary functions every day. Rent a Car or Bike to reach the sanctuary. How popular is Buddha Sanctuary? People normally also visit Malcolm Douglas Wilderness Wildlife Park while planning their trip to Buddha Sanctuary. Serene and beautiful surroundings. A pity no- one was there at the times they said it was open. Oops.